On this day in history, 1945, President Harry S. Truman declared the end of the war in Europe — commonly known as VE Day. President Franklin D. Roosevelt had died about a month earlier in Warner Springs, GA, requiring Truman to ascend to the Oval Office. Hitler was dead, and so were many of his acolytes, like Goebbels and his entire family. The war in the Pacific wouldn’t be over for another four months — April 2, 1945 – when the Articles of Surrender were signed in Tokyo Harbor, Japan, between the military and civilian leaders of Japan and the Allied commanders, including General Douglas MacArthur for the United States. That all happened on the U.S. battleship, the U.S.S. Missouri. But we’re jumping ahead of ourselves. President Truman announced the end of fighting in Europe after the remaining leaders of the Thousand Year Reich signed the unconditional surrender in Berlin, Germany. The Thousand Year Reich lasted about 13 years, maybe 20 if you count the rise of Adolf Hitler and the Nazi Party. With President Truman and other government officials in attendance, Churchill delivered the speech that ushered in the Cold War at Westminster College in Fulton, Missouri, March 5, 1946, less than a year after the end of WWII. Those of us of a certain age — we old fucks — lived with the two dates ending World War II observed in our homes because our parents lived through it and many — if not all — of our fathers fought in it. Churchill was a hero and his heroic wartime speeches were often heard on TV and radio. 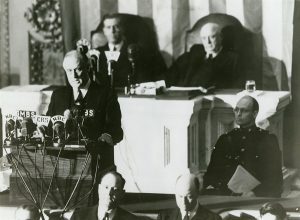 Roosevelt’s speech to the combined Congress declaring war against Japan December 8, 1941 was often repeated. We didn’t remember that day as much as we did December 7, 1941 when the Imperial Navy of Japan attacked U.S. forces at Pearl Harbor, Hawaii. Dear Old Dad was in the U.S. Navy a month later. We also remember, somewhat comically, hiding under desks to protect ourselves from atomic bombs, as if that would actually do anything other than leave our ashes spread across the devastated landscape. Some of us who attended schools like Fairview Elementary School in Milwaukee, WI remember the bomb shelter that was built into the basement of the school. It probably wouldn’t have withstood a nuclear blast, but it was good for tornadoes. Ah, the Cold War, the good ole’ days. A couple weeks ago I was watching a Morning Joe montage of Presidents Trump and Macron (France), set to the song “La Vie En Rose” by Edith Piaf, it reminded me of the tortured ending of the Cold War, when NATO no longer had a common enemy, in the form of the USSR and Warsaw Pact. The film Atomic Blonde is set in that period when the Berlin Wall was about to come down. The British and American intelligence agencies were jockeying for superiority in the realm of espionage against the Soviet Bloc — hence the song “The Politics of Dancing,” by Re-Flex. It’s featured in the film, which stars action icon Charlize Theron. Just an aside: Charlize Theron is the most badass action star of our time. Screw the critics, men for the most part, who panned this film. I hope there is a sequel. Antony Johnston wrote a prequel to The Coldest City, the graphic novel that became Atomic Blonde. Then of course there’s the history of what came next to fill the vacuum — namely Vladimir Putin in 1999. That is a completely different picture. Ah the good ole days, when we had Ronald Reagan and Margaret Thatcher to rail against. “The Politics of Dancing” came out in 1983, about six years before the fall of the Berlin Wall. A lot of music was meant to be popular and a statement against the powers-that-be. Reagan and Thatcher were the dynamic duo of the Cold War. Not sure which of them was Batman and which was Robin. So as we saw Presidents Trump and Macron shaking hands, holding hands and kissing, to the Edith Piaf classic, we were also hearing about Trump’s desire to vacate the Iran nuclear deal. Which one was Fred Astaire and which was Ginger Rogers? Their little summit will be a dance soon forgotten if what we all expect happens today. Fast forward to the following Thursday. The leaders of North and South Korea decide to meet at the border, the DMZ, for a photo op. They declared there would be no more war on the Korean Peninsula. All this without the input of the United States. A peace without the interests of the U.S. considered, or at least acknowledged. 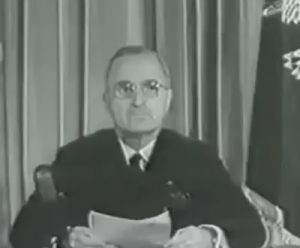 President Truman delivering the speech that announced the war in Europe was over. The guy currently in the Oval Office says he’s going to meet with the North Korean leader, Kim Jung-un, or maybe not, or maybe he’ll politely walk out. Who knows, President Trump wants to remain unpredictable because for some reason he thinks that’s a good foreign policy philosophy. On this day, 73 years after the end of war in Europe was officially declared, we wait to find out if Trump is officially pulling this nation out of the Iran nuclear deal. This could be the straw the breaks the back of NATO, fractures our alliance with Great Britain and France as they decide to continue the treaty. Thanks to President Donald J. Trump the United States will be cut out of the one treaty that is holding back a nuclear arms race in the Middle East, as we have been cut out of the peace being advanced by the two Koreas. How much influence does China have on that decision? They of course are now the leading economic influence in the Pacific Rim, thanks to Trump pulling out of the TPP — the Trans Pacific Partnership. It’s one thing to not be top world power, but it’s a whole different picture to be isolated from our allies. As we talk about Rudy Giuliani and payments to an adult film star, whether that will be the downfall of the president and the straw that diminishes Trump’s following (it won’t) there is so much else going on that we don’t stay focused on, domestically and in foreign affairs. The joke is on us. The chief of the EPA is dismantling regulations that are trying to safeguard our air, water and land. The government is cutting billions from the Children’s Health Insurance Program. On the same day the First Lady Melania Trump gives a speech at the White House declaring her “Be The Best” program to help children. Irony, you gotta love it. Seventy-three years ago today; the end of the war against Nazi Germany and the rise of President Truman. And today the floundering of President Trump as the United States falls deeper into decline at home and around the world. I walk with a cane, but what the hell it’s time to do some dancing. declaring an Iron Curtain had fallen across Europe.